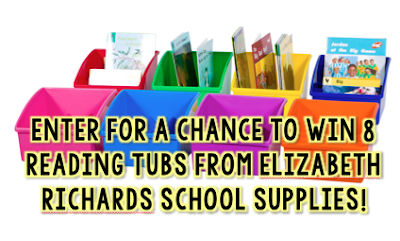 Giveaway for 8 Reading Tubs from Elizabeth Richards School Supplies! On Friday, I blogged about how in love I am with these Elizabeth Richards School Supplies Reading Tubs! These boxes are durable, colorful, and a great deal. I am using these Reading Tubs in my classroom this upcoming school year for style and functionality. Elizabeth Richards School Supplies is a company that is new in the US school market, but have been designing and creating products for Australian schools for over 30 years! As a classroom product junkie, I was stoked to get to try out some of their products! These Reading Tubs are perfect for organizing lessons/assessments/worksheets for the week, holding your students' personal books, displaying read alouds for the week, holding your guided reading books, storing manipulatives, or organizing the books for your classroom library! Functional and cute- does it get any better?! I am raffling off TWO sets total of these fantastic Reading Tubs. Each set contains eight bins. You will receive one of each color (red, green, yellow, blue, orange, purple, royal blue, and pink!). 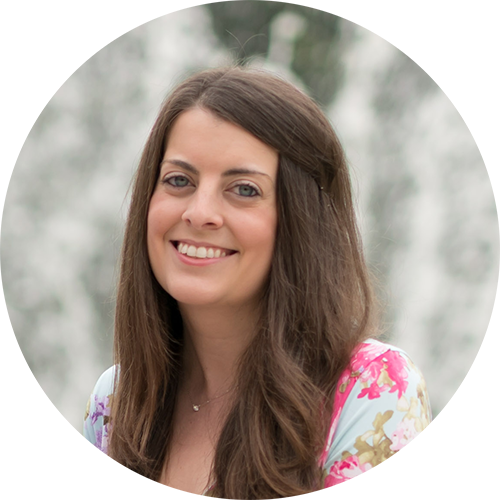 Elizabeth Richards School Supplies provided me with an exclusive promotion code to save you money! Use the code 10%OFFERUSA to receive a 10% discount of any purchase, valid until June 30, 2016. Simply enter the code in the discount area to check out! Shipping is also free with any order over $75. Want to win a set of your own? To enter, there are a few choices! 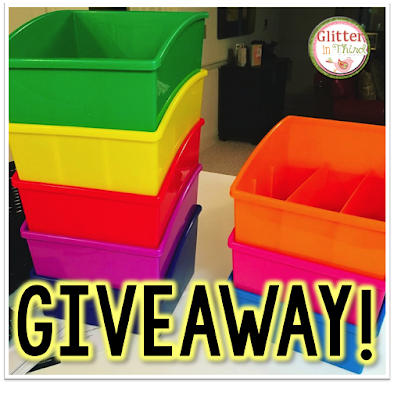 You can "like" Glitter in Third on Facebook, follow Glitter in Third on Teachers Pay Teachers, follow Glitter in Third on Pinterest, and/or just shout out how you would use these awesome Reading Tubs in your home or classroom in the comments section of this post. You can enter up to four times. Enter using Rafflecopter below. You can enter up to four times by either commenting, liking my Facebook page, following Glitter in Third on Pinterest, and/or following Glitter in Third on Teachers Pay Teachers! Thank you to Elizabeth Richards School Supplies for providing me with these Reading Tubs to raffle off and share with my readers! These would be so awesome in my class next year for both reader's and writer's workshop! These look fabulous!!! We are starting a new writing program and it includes lots of mentor text. These tubs would be great for holding all of those books! I need some different book tubs for my classroom library. I would use 4 baskets for guided reading group materials and the other 4 for my guided math group materials. I'm looking for new tubs for my fiction books in my classroom library. These would be great! My book bins are from the Dollar Store - they can always be replaced with these beautiful ones! 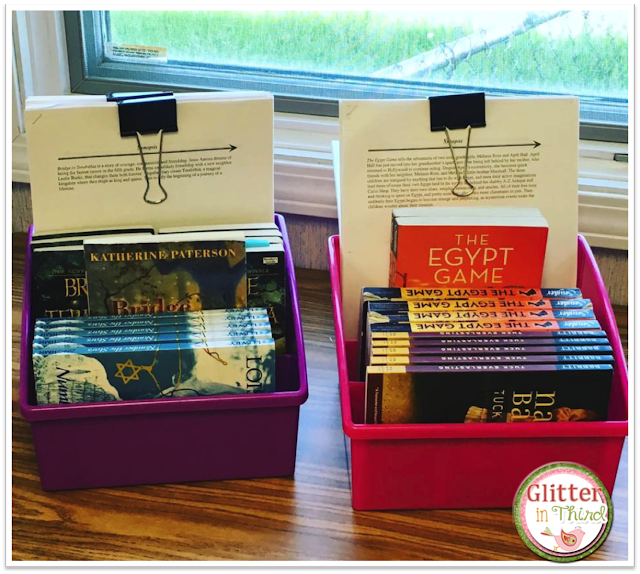 I would love to update my dollar store bins with these amazing reading bins! These would be great for my reading groups! These tubs would be super helpful during our Flier Time. We split all our third graders into leveled reading groups to do Guided Reading. As the head ELA teacher, I am in charge of our books. These tubs would help me split up the resources that we would need for our grade level. AND we have 8 teachers so we'd each get a bin! I would use these for organizing our library. Reading group materials! Plus, you can never have enough bins! These would be great for guided reading materials and math intervention materials! I am moving from 1st to 3rd in the fall and will be teaching Reading. I would so need these to teach small groups! I would use this tubs to organize what I want my students to be reading in literacy centers and in my guided reading groups. I would use these tubs to facilitate book clubs in class. I'd use these for small group math and guided reading! I would love to use these to organize for math and reading groups! I would use the tubs for Math groups. I like to use colors to organize my materials! It's easy to differentiate and the kids have no idea!!! These would be great for my reading groups next year. These would be great for organizing guided reading group materials and also literacy work stations! I would organize my guided reading sets. These would be great for guided reading groups or to organize the classroom library! Use to store guided reading things. These would be awesome for organizing guided reading and guided math materials. I would love to have these to help me with my organization phobia! These would be awesome for guided reading groups! These tubs would be perfect for my first year as a third grade teacher to use in guided reading groups! Update our reading nook bins! I would love to use these for mentor texts our my small group reading. There are so many ways to use such a cute set. Thank you! I would love these to organize my leveled readers. My school is just beginning guided reading next year!!! I would LOVE to have these containers to organize all that I am going to use! I have actually been stressing over how to organize! These would be perfect! These containers would be great for organizing my classroom library! I would love to have these containers to organize my classroom library! Also, I think they would be great for organizing my guided reading groups. These would be great for organizing materials, books, and assignments! I would use these in my guided reading groups! These would be awesome in my reading center. I am reorganizing it for next year. These tubs would be wonderful for my reading area. I would use these for our reading and writing centers. These would be a great organizational tool! Thanks for the give away! I would use some to organize my guided reading for groups and then to hold the picture books I read aloud to students on top of our bookshelves. These reading tubs would be perfect for organizing my guided reading groups! These would be great to have for book clubs/ literature circles! I can see these used for other subjects as well, for small groups! These would be great for the many class sets of novels I inherited this summer. I am teaching HA for the 1st time so this should keep me organized. These would make planning my guided reading and math time so much easier! I would use them to divide up levels. These would be great for leveling my library and using them for small groups. These would be great for keeping my daily reading and math centers organized. Would love to win!! Would use these guided reading! These would be great to continue improving my classroom library. I currently use cardboard boxes and slowly buy bins each year! I would love to use these bins to organize my small groups in reading and in math! I would love to use these to level out my reading groups!! It would be a great visual for my kinders!!!! I would put these on student tables! That way they have reading materials in the morning and when they finish up work. I would use these bins to differentiate my reading and writing groups in the classroom. I think they would help me and my students differentiate their levels based on my new data wall system. My library needs a make over - these would be a great start! So cool! Awsome idea for guided reading and math! Thanks for sharing. I would organize my guided reading materials for all of my different groups! I would color code my reading levels and have the tub color be theirs so they can find books easily. I'd love to use these to organize my guided reading materials. This product would be useful to organize materials for my reading groups. I am going to be a first year teacher in a district that is starting reading and writing workshop next year so these would be perfect to organize the materials! They would also be great for small groups! I have moved to a new city and will be starting a new chapter by returning to my roots of teaching third grade this next school term. These bins would be perfect for my reading workshop, library area or small group purposes. I am organizing my classroom library this summer and I would love these! These would be great for reading groups. These tubs would be great for guided reading groups! These would be awesome to have in my classroom. I could use them to level my library! I would Use these to redesign and re-organize my classroom library! Thanks for the chance to win! I would use these to organize materials for my guided reading groups. I would use these tubs to organize my classroom book sets. They would be so functional in 2nd grade! My classroom library needs a makeover! These would be so awesome to brighten it up! Thank you for the opportunity! I will be a first year teacher in the Fall 2016. I will be teaching in a second grade inclusion classroom. Gathering all of the supplies for a first year classroom can be daunting. These tubs will be absolutely wonderful for my classroom library. They will be color coded by genre/level. This will be my first year teaching 3rd grade, so these would be immensely helpful for guided reading! These would be great for small groups and guided reading. These would be a great asset to both my library and my guided reading/ book club. Thanks for the opportunity to win! I just changed rooms and grade levels! I would use these with my small reading groups and centers! Would love love love to win!!! I would love them for Guided Reading tubs. I have so many supplies & so little room! There are so many uses for these tubs!! I would love them! Would love to add these bins to my library. I home school my 4 children. Would love to have these to organize our "Feed our Brains" book area. I would use these to organize my math small group activities and reading small group activities. These tubs will help keep me and the students organized!